To live like a lion for a day is far better than to live like a jackal for a hundred years. 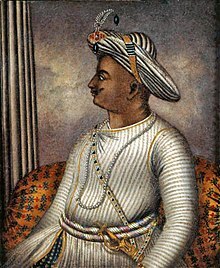 Sultan Fateh Ali Tipu (20 November 1750 – 4 May 1799), also known as the Tiger of Mysore, was the de facto ruler of the Indian Kingdom of Mysore from 1782 until his death in 1799. He was a scholar, warrior and poet. To live like a lion for a day is far better than to live for a hundred years like a jackal. It is far better to live like a lion for a day than to live like a jackal for a hundred years. It is far better to live like a tiger for a day than to live like a jackal for a hundred years. People who have sinned against such a holy place are sure to suffer the consequences of their misdeeds at no distant date in this Kali age in accordance with the verse: Hasadbhih kriyate karma rudadbhir-anubhuyate (People do [evil] deeds smilingly but suffer the consequences crying). Over 12,000 Hindus were 'honoured' with Islam. There were many Namboodiris (Brahmins) among them. This achievement should be widely publicised among the Hindus. There the local Hindus should be brought before you and then converted to Islam. No Namboodiri (Brahmin) should be spared. Also they should be confined there till the dress materials sent for them, reach you. I am sending two of my followers with Mir Hussain Ali. With their assistance, you should capture and kill all Hindus. Those below 20 may be kept in prison and 5,000 from the rest should be killed by hanging from the tree-tops. These are my orders. Tipu Sultan's Letter dated December 14, 1788, to his Army Chief in Calicut: cited in Bhasha Poshini of Chingam 10, 1099 (August, 1923), Article on Tipu Sultan by Sardar K.M. Panicker. Also quoted in Ravi Varma, " Tipu Sultan: As Known In Kerala" in Tipu Sultan: Villain or hero? : an anthology. (1993). With the grace of Prophet Muhammed and Allah, almost all Hindus in Calicut are converted to Islam. Only a few are still not converted on the borders of Cochin State. I am determined to convert them also very soon. I consider this as Jehad to achieve that object. Tipu Sultan's Letter dated January 18, 1790, to Syed Abdul Dulai: cited in Bhasha Poshini of Chingam 10, 1099 (August, 1923), Article on Tipu Sultan by Sardar K.M. Panicker. Also quoted in Ravi Varma, " Tipu Sultan: As Known In Kerala" in Tipu Sultan: Villain or hero? : an anthology. (1993). Don't you know I have achieved a great victory recently in Malabar and over four lakh Hindus were converted to Islam? I am determined to march against that cursed Raman Nair (Rajah of Travancore) very soon. Since I am overjoyed at the prospect of converting him and his subjects to Islam, I have happily abandoned the idea of going back to Srirangapatanam now. First a corps of 30,000 barbarians who butchered everybody on the way, followed by the Field-Gun Unit under the French Commander, M. Lally. Tipu Sultan was riding on an elephant behind which another army of 30,000 soldiers followed. Most of the men and women were hanged in Calicut. First mothers were hanged with children tied to the necks of their mothers. That barbarian Tipu Sultan tied the naked Christians and Hindus to the legs of elephants and made the elephants move about till the bodies of the helpless victims were tom to pieces. Temples and Churches were ordered to be burnt, desecrated and destroyed. Christian and Hindu women were forced to marry Muhammadans and similarly their men were forced to marry Muhammadan women. Those Christians who refused to be 'honoured' with Islam, were ordered to be killed by hanging then and there. The above version of the atrocities was obtained from the sorrowful narration by the victims who escaped from Tipu's army and reached Varapuzha (near Alwaye) which is the centre of Carmichael Christian Mission. I myself helped many victims to cross the Varapuzha river by boats. Fra Bartolomaco, in his well-known book, Voyage to East India, Cited in History of Cochin State by K.P. Padmanabha Menon, Mathrubhoomi Publication, 1989. p. 573. Also quoted in Ravi Varma, " Tipu Sultan: As Known In Kerala" in Tipu Sultan: Villain or hero? : an anthology. (1993). As soon as he had conquered Egypt, he will establish relations with the Indian princes and, together with them, attack the English in their possessions. Having occupied and fortified Egypt, we shall send a force of 15,000 men from Suez to India, to join the forces of Tipu-Sahib and drive away the English. Napoleon Bonaparte wished to establish a French presence in the Middle East, with the ultimate dream of linking with Tippoo Sahib. Quoted in Iradj Amini (1 January 1999). Napoleon and Persia: Franco-Persian Relations Under the First Empire. Mage Publishers. pp. 12–. ISBN 978-0-934211-58-1. According to the official report of Col. Fullarton of the British forces stationed in Mangalore, worst type of brutalities on Brahmins were committed by Tipu Sultan in 1783 during his siege of Palghat Fort which was being defended by the Zamorin and his Hindu soldiers. "Tipu's soldiers daily exposed the heads of many innocent Brahmins within sight from the fort for Zamorin and his Hindu followers to see. It is asserted that the Zamorin rather than witness such enormities and to avoid further killing of innocent Brahmins, chose to abandon the Palghat Fort". Malabar Manual by William Logan (Printed and published by Charitram Publications under the editorship of Dr. C.K, Kareem, Trivandrum). p. 500. Also quoted in Ravi Varma, " Tipu Sultan: As Known In Kerala" in Tipu Sultan: Villain or hero? : an anthology. (1993). In the month of Chingam 952, Malayalam Era (corresponding to August, 1786) Tipu's Army destroyed idols of the famous Perumanam Temple and desecrated all the temples between Trichur and Karuvannur river. Irinjalakuda and Thiruvanchikulam temples were also defiled and damaged by Tipu's Army. History of Kerala by A. Sreedhara Menon. Also quoted in Ravi Varma, " Tipu Sultan: As Known In Kerala" in Tipu Sultan: Villain or hero? : an anthology. (1993). My victorious sabre is lightning for the destruction of the unbelievers. Haidar, the Lord of the Faith, is victorious for my advantage. And, moreover, he destroyed the wicked race who were unbelievers. Praise be to him, who is the Lord of the Worlds! Thou art our Lord, support us against the people who are unbelievers. He to whom the Lord giveth victory prevails over all (mankind). Oh Lord, make him victorious, who promoteth the faith of Muhammad. Confound him, who refuseth the faith of Muhammad; and withhold us from those who are so inclined. The Lord is predominant over his own works. Victory and conquest are from the Almighty. Bring happy tidings, Oh Muhammad, to the faithful; for God is the kind protector and is the most merciful of the merciful. If God assists thee, thou wilt prosper. May the Lord God assist thee, Oh Muhammad, with mighty victory. It was not only against the Brahmins who were thus put in a state of terror of forcible circumcision and conversion; but against all sections of Hindus. In August, 1788, a Raja of the Kshatriya family of Parappanad and also Trichera Thiruppad, a chieftain of Nilamboor, and many other Hindu nobles who had been carried away earlier to Coimbatore by Tipu Sultan, were forcibly circumcised and forced to cat beef. Nairs in desperation, under the circumstances, rose up against their Muslim oppressors under Tipu's command in South Malabar and the Hindus of Coorg in the North also joined them. Malabar Manual by William Logan (Printed and published by Charitram Publications under the editorship of Dr. C.K, Kareem, Trivandrum). p. 500. Quoted in Ravi Varma, " TIPU SULTAN: AS KNOWN IN KERALA" in Tipu Sultan: Villain or hero? : an anthology. (1993). Also quoted in Ravi Varma, " Tipu Sultan: As Known In Kerala" in Tipu Sultan: Villain or hero? : an anthology. (1993). Hindus, especially Nairs and chieftains who resisted Islamic cruelties, were the main targets of Tipu's anger. Hundreds of Nair women and children were abducted to Sreerangapatanam or sold as slaves to the Dutch. Nairs were hunted down and killed and also deprived of all traditional and social privileges. Thousands of Brahmins, Kshatriyas, Nairs and other respected classes of Hindus were forcibly converted to Islam or driven out of their traditional ancestral homes. Thousands sought refuge in Travancore State while hundreds fled to forests and hills to escape Tipu's atrocities which had completely shaken their sense of security.. The new phase of Mysore administration in Kerala resulted in unending wars. Extreme cruelties of the invading army had badly affected every section of the society, leading to the mass exodus of people from Malabar.. Many Hindu temples, royal houses and chieftain families were destroyed and plundered. The exodus of Brahmins and Kshatriyas who were the patrons and custodians of traditional arts and culture, resulted in stagnation in the cultural field also. The Sultan, therefore, in his infancy being like all children fond of play, and as in that space boys of Kinhiri Brahmin castes assembled to amuse themselves, was accustomed to quit the house to see them play, or play with them. It happened one day that a Fakir (a religious mendicant) a man of saint-like mind passed that way, and seeing the Sultan gave him a life bestowing benediction, saying to him, 'Fortunate child, at a future time thou will be the king of this country, and whey thy time comes, remember my words-take this temple and destroy it, and build a Masjid in its place, and for ages it will remain a memorial of thee.' The Sultan smiled, and in reply told him, 'that whenever, by his blessing, he should become a Padishah, or king, he would do as he (the Fakir) directed.' When, therefore, after a short time his father became a prince, the possessor of wealth and territory, he remembered his promise, and after his return from Nagar and Gorial Bundar, he purchased the temple from the adorers of the image in it (which after all was nothing but the figure of a bull, made of brick and mortar) with their goodwill, and the Brahmins, therefore, taking away their image, placed it in the Deorhi Peenth, and the temple was pulled down, and the foundations of a new Masjid raised on the site, agreeably to a plan of the Mosque built by Ali Adil Shah, at Bijapur, and brought thence.